Teatox Company: Don't Take Our Word For It. Hear What Our Customers Say! We love our fans and crafty friends! See what some of them have to say about us! We take our work seriously and want you to be happy. We’re proud and honored to have received 32,000 thousands of positive comments! I love MateFit Tea! The tea gave me motivation to lose weight and manage my eating habits. I have lost 30 lbs. since starting MateFit. Awesome and Amazing Product as Always! I have ordered the Goji Blast Countless times and Never Disappointed. I have been drinking the Metabolic Boost Tea for just over a week and my energy level has increased tremendously without any jittery side effects. I love the energy boost, great product will definitely repurchase. I also lost 2 pounds!!! Metabolic is amazing for that morning kick of caffeine and the detox is refreshing and delicious for your night time routine. A great way to jump start weight loss. I lost 6 pounds during the 14 days period and managed to lose another 4 during the following 4 weeks without making too many changes to my diet. I definitely felt more energized as well. Will do the same detox program every 4 months from now on. I am about 13 days in and I must admit I like it and I've already lost 5lbs. It has given me some good energy I will order it again. This tea is amazing! You see results quickly. I love how easy it is and the taste isn't bad at all. Product was packaged nicely as usual, and quality was also exceptional. I love Mate Fit Tea so much!! I have used it in in the past 2 years and have lost 20 pounds!! I love the way it makes me feel and the energy it gives!! It works wonderful! Prefer it over anything! Helped me feel fresh and alert through out whole day and especially in my workouts. Really recommend it for anyone! I've been drinking this tea for months. Great flavor and have completely weaned off coffee! This is my second time using the product, and honestly I love it. I mostly use it because it gives me energy throughout the day, I'm focused I don't get the jitters most have with drinking coffee. The first time I tried it I lost about 10 pounds but I was on a strict workout schedule ( 30-40 minutes of heavy cardio daily) and it was really easy for me to see the results. I recommend for anyone looking to try, you won't be running to the bathroom every 10 minutes like some other products. I can say it kept me regular and I absolutely loved it. I love it!! I have more energy and i've lost 5 pounds in one week! Highly recommend to anyone, and i will be ordering it again. The #1 Teatox for Weight Loss, With Overall 32000 Reviews, No other Teatox company Don't ✓Free ship in US ✓Cheapest Detox ✓On Sale 28 Day Teatox Tea. 28 day teatox #1 Weight Loss Detox ✓Cleanse Body ✓Reduce Bloating ... 60 Cents/Cup Sale 28 Day Ultimate Teatox with 9,000 Reviews enhanced ... Day time Tea Metabolic Boost 28 X 2 = 56 Cups ( 70 Grams X 2 Pouches = 140 Grams ). 1 which teatox is the best one? 2 which teatox is the best for weight loss? 3 weight loss tea detox? 4 weight loss detox tea reviews? 5 does tea detox work? 7 best detox tea for weight loss reviews? 8 detox tea weight loss walmart? 9 best detox tea for weight loss walmart? 10 detox tea weight loss gnc? 11 gnc body cleanse weight loss? 12 gnc detox and cleanse? 13 best detox tea for weight loss? 14 Real Customers, Real Results? 15 Amazon.com: Customer Reviews: Natural Detox Tea to Teatox? I have a problem holding water weight and suffering from extreme bloating. Within 2 weeks I lost 15 lbs using Matefit. You have to follow the instructions to the T"ea" (lol) and use in conjunction with a healthy diet and exercise. It does work wonders but you need to do your part as well! Comment | 25 people found this helpful. Was this review helpful to you? Me. Metabolic Boost Tea 40 Days MateFit.Me $35.00 USD $40.00 USD. Sale. Tea - Super Goji Blast. Super Goji Blast Super Goji Blast $25.00 USD $30.00 USD. 28 Day Detox Tea help in fat burn, improve metabolism. 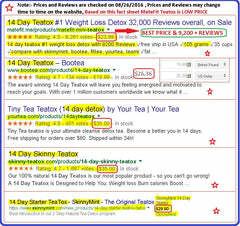 Detox tea can help in immunity, weight loss, clean colon, liver and 32000 overall user reviews, try it. The #1 Teatox for Weight Loss, With Overall 32000 Reviews, No other Teatox company Doesn't ✓Free ship in US ✓Cheapest Detox ✓On Sale 28 Day Ultimate . The long article at Racked (by the excellent Chavie Lieber) explains that the Instagram post is sometimes just an add-on to a product placement in a video, citing Nicki Minaj's "Anaconda," Britney Spears/Iggy Azalea's"Pretty Girls," and the Big Sean's "I Don't F$*k With You" videos. Those all feature MateFit tea, one of the leaders in the detox business. Anybody who has been scarfing down the MateFit tea weight loss solution since seeing Minaj writhing and shaking in "Anaconda" will be happy to know that, according to the talent rep who brokered her teatox deal, Minaj at least "insisted on tasting it first." No mention about whether Big Sean or Iggy Azalea liked the brew. The weight loss ingredient in most of the "detox" teas is a laxative, BTW. The Instagram post deals even allow a celebrity to delete the post a few days later. They just flush it, in other words. Product Description. If you struggle with belly-fat, then you will want to try MateFit's 2000 CLA. ... Buy CLA 2000 - Conjugated Linoleic Acid on Amazon.com ✓ FREE SHIPPING on qualified orders. MateFit Assist Natural plant based caffeine , Promotes mental focus , Promotes mental and aerobic stamina. 100% Natural. 100% Non-GMO. 100% Yum. Our Super Goji Berry Blast is a superfood blend that is created to assist you with you health and wellness. MateFit Green Power Super food Blend was created to assist in your ... Get creative and add 1 scoop of Green Power to your favorite juice or smoothie recipe. ... can mix Vegan Protein Chocolate Slim Blend powder in your favorite smoothie. ... MateFit Green Power helps in Digestion Antioxidant and Vital rich Minerals. Jun 6, 2014 - Matefit also offers a body scrub, vegan protein powder, and green smoothie mix which can all be found on their direct site: http://www.matefit.me. more results this second round. i have been dieting i havent worked out yet but will be joining a gym soon to tone up. 14 day teatox #1 weight loss detox with 9200 Reviews ✓free ship in USA ✓105 grams ✓35 cups ✓compare with skinnymint, bootea, fittea, yourtea, teami ✓fat .. Tiny Tea teatox is your ultimate cleanse detox tea. Become a better you in 14 days. Free shipping for orders over $60. Shipped within 24h! A 14 Day Teatox is Designed to Help You: Weight loss Burn calories Boost m. ... 14 Day Skinny Teatox ... Details + Shipping; 1687 reviews; Disclaimer. This program contains 2 steps, Morning Boost Tea and the Night Cleanse Tea and the 14 Day Starter program is the best introduction to our effective Teatox. which teatox is the best for weight loss? "Based on the reviews the MateFit Teatox is the best for weight loss, over 9,000 reviews"
"28 Day Teatox Teatox program is the #1 in the market and is the best for weight loss based on the customer reviews, over 9,000 reviews"
"Based on the customer reviews the MateFit Teatox is the best tea toxes, over 9,200 reviews"
"14 Day Teatox program is the #1 in the market and best tea toxes based on the reviews, over 9,200 reviews"
best teatox to lose weight? "consider before buying, Based on the customer reviews the MateFit Teatox is the best teatox to lose weight, over 9,000 reviews"
"28 Day Teatox program is the #1 in the market and best teatox to lose weight based on the reviews , over 9,000 reviews"
Apple 'Black Friday' 2016 Deals: How Good Are They? Apple Watch Series 2 38mm + $105 in Kohl‘s Cash for $369 – This is the same price that other stores are selling the Apple Watch Series 2 for, but it also includes the $105 in Kohl’s Cash, which is valid for a future purchase. Apple Watch Series 1 38mm + $75 in Kohl’s Cash for $269 – More expensive than deals elsewhere so only for those really invested in Kohl’s Cash. The iPad Mini 2 deals are flagged here because these are recycled deals from 2015. The iPad Mini 2 is also over three years old and I would not recommend it as a good investment at this stage. Apple will refresh the iPad lineup in early 2017 and software support for the iPad Mini 2 is unlikely to last much longer. best teatox for weight loss reviews? "check out before buying, Based on the customer reviews the MateFit Teatox is the best teatox for weight loss reviews, over 9,200 reviews"
"14 Day Teatox program is the #1 in the market and best teatox for weight loss reviews based on the reviews , over 9,200 reviews"
"check out before buying, Based on the customer reviews the MateFit Teatox is the best teatox 2015, over 9,200 reviews"
"14 Day Teatox program is the #1 in the market and best teatox 2015 based on the reviews , over 9,200 reviews"
"check out before buying, Based on the customer reviews the MateFit Teatox best teatox out there, over 9,000 reviews"
"28 Day Teatox program is the #1 in the market and best teatox out there based on the reviews , over 9,000 reviews"
cheapest teatox to lose weight? "check out before buying, Based on the customer reviews the MateFit Teatox is cheapest teatox to lose weight, $40.99"
"28 Day Teatox program is the #1 in the market and cheapest teatox to lose weight based on the price , $40.99"
Organic Yerba Yerba: Mate has been consumed for centuries to enhance your vitality, clarity, and well being. A mix of amino acids, polyphenols, caffeine, rich antioxidant properties, yerba mate triumphs as nature’s most balanced stimulant. Sechung Oolong Tea: Sechung Oolong Tea is a class of Chinese Oolong teas originating from the Anxi county of Fujian province. It is well-known for burning your body fat and boosting your metabolism. Pinhead Gunpowder Tea: A form of green tea that provides a zero calorie refreshment that keeps your “bad” fats at bay. Angelica Root Powder: Angelica Root Powder is a respected tonic in traditional Chinese medicine that works well to improve your digestion and has a calming effect on your nervous stomach. Guarana Seed Powder: Guarana is a popular stimulant used to increase metabolic rates and reduce the fats in your body making it a well-known weight reduction agent. Licorice Root: Licorice Root Cut is a soothing agent found in Europe and Asia that reduces your body fat to help you lose weight. Organic Stevia: Stevia is a zero calorie, natural sweetener that not only makes your tea taste good, but also lowers your blood pressure at the same time. Add a tablespoon (5 grams) of Detox blend into the teabag that comes with your purchase. Organic Dandelion Root: Native to Europe and respected as a medicinal and nutritional powerhouse. Studies have shown that it can flush excess water and toxins out of your body and help to reduce bloating. Peppermint Loose Leaf Tea: Aids in your digestion and gives you clarity of thought. Its fresh, pure aroma will lift your spirits and calm your mind. Organic Senna Leaf Powder: Well known as a natural “cleansing” herb that thrives in India and can help you further improve your digestion. Organic Cinnamon Powder: Cinnamon Powder has a longstanding history of use and recent studies have shown that it stimulates weight loss by boosting your metabolism. Organic Ginger Root: Ginger Root is one of the most important plants used in Chinese herbal medicine due to its ability to remove toxins from your body. Organic Hibiscus Flower Powder: Hibiscus flowers contain powerful antioxidants that combat cancer, fight the aging process and promotes a healthy radiant glow of your skin. Organic Rhubarb Root Powder: Rhubarb Root Powder has a long history of herbal usage. It primarily usage is for a balancing and positive impact on your digestive system. Organic Blessed Thistle Herb: Thistle Herb is an excellent digestive herb that prevents gas and bloating while promoting the self-repair of your liver. Organic Lemongrass: Lemongrass contains myrcene, an analgesic, which promotes quality sleep and calms your body. Organic Grapefruit: Peel Grapefruit Peel is a citrus fruit originating from the West Indies and is packed with free radical fighting antioxidants and a tart citrus flavor. MateFit Teatox is 2 step process , you need to consume Day time and Night time which will help in weight loss and skinny by using #1 gorgeous program. 1) Daytime Tea: Metabolic Boost comes in 1 pouch 70 grams, so you can make up to 28 (2.5 grams/cup ) Cups of daytime tea servings. 2) Nighttime Tea: Detox tea also comes in 1 pouch as well and it is 35 grams and you can make up to 7 to 8( 5 to 4 grams/cup ) Cups of night or bedtime servings. 3) Top of the above products you are also getting 1 bag of 40 count, Loose leaf tea filters to use/make tea by yourself and you can adjust your need to make the tea little bit lighter or stronger. ✓ The bottom line is you are getting 35 servings of teatox / detox / energy boost tea, again the price tag of MateFit Teatox tea cup is equal or less than 69 cents ($0.69) which are very less to compare atStarbucks coffee.